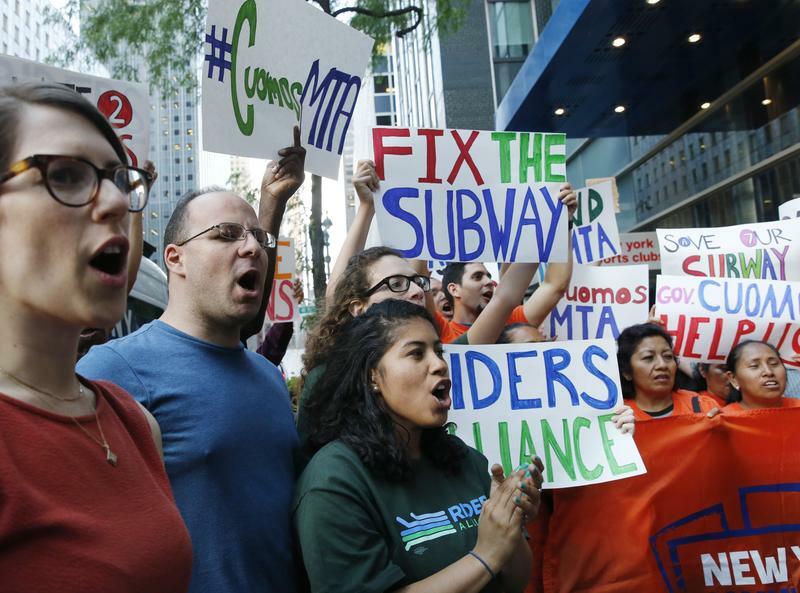 NYPIRG Straphangers representative Jaqi Cohen, far left, and Michael Sciaraffo, second left, join transit advocates in a rush hour rally outside Gov. Cuomo's office in June. A new poll finds Governor Cuomo’s popularity has dipped to a near record low, and the reason could be dissatisfaction in New York City over the Governor’s handling of the mass transit system. In a season that Cuomo himself has already dubbed the “summer of hell” because of transit problems, the Quinnipiac University poll finds the governor’s favorability rating is under 50 percent, at 46 percent. And New Yorkers give him poor grades for his handling of the MTA, where 58 percent give him a grade of “C” or lower, says Quinnipiac polls spokesman Mickey Carroll. The poll also finds that while most think Cuomo could be an effective national leader against the policies of President Trump, the majority don’t think he should run for president in 2020. Cuomo says he’s focused on being governor and seeking reelection to that post in 2018.